i have the utmost confidence this will be a very short geeklist. there maybe some scruffy challengers who think they're ready (maybe some unbeknownst game featuring puck and human hygiene) but i've searched the games database and there are no gary colemans or peewee hermans in our midst, the best out there is an omar sherif game (knock out first round). and i've seen the kid with the green goo and the tighty whiteys with the skids... dont even try. this is heavy weight wackiness we're talking about. i'll call an honest match and announce a winner (this judge can be swayed by massive consensus). thank you to all of the contenders. unfortunately there can only be one champion. and in this corner the undisputed champion of whack who laughs in the face (er chest?) of busen memo. starting off in modest beginnings with some kids declaring "this game is cool" in between choruses of "ice ice baby dun da dun dun dun dun dun..." who would of thought that with the rise of the likes of nwa and the typhoon of public ridicule of its namesake we would see this game rise from its humble beginnings to champion of the gaming world. from christmas wishlists to pure "oh my god, this must be hell" magic (Michael Debije). this game will put the smackdown on any challengers. 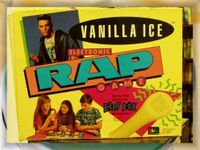 it features the electronic beat box for petes sake. 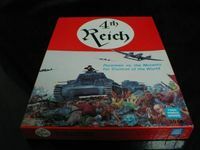 It's hard to think of a more satirical game than Panzer Pranks ("WWII as it really was in the movies"). Where else do you find rules about stacking female and male tanks in the same hex, resulting in unintentional pregnancies and paternaty suits. 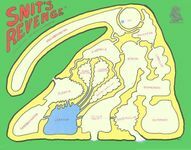 A tongue-in-cheek fantasy game including the Evelyn Woods, the Avalon Hills, etc. The game of communal nose picking. "All together, you can stick your fingers into up to as many as four noses. The best picker is the one who optimally uses length, width and angle to fish out the fattest boogers." Stop poking me! Ow! I mean it! That hurts! 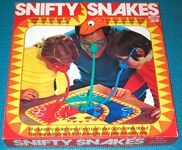 A game where you put on your plastic snake glasses and push pawns about without using your hands. 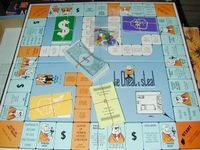 Lie, Cheat & Steal is a political simulation in which the players are trying to be elected to public office. Unlike most political simulations, which are based on how elections are supposed to be run, Lie, Cheat & Steal uses true political methods of vote buying, libel and under the table deals to advance to office. While it might be a rewarding goal to get your opponent to shed their clothing ... you might figure they'd picked a more interesting game for it. Let's brainstorm here, hmm ... Strip Panzerblitz anyone? ... and if that is too racey for you (or you don't like games were you have to be dressed for success) then there's always this. Babe Winkelman puts the smack-down on Vanilla Ice any day. Morgan mentioned this recently... it's a roll-and-move game in which the players control sloths. Whoever comes last in the race is the winner, and the optimal strategy is to fall asleep for most of the game (in which case your sloth gets a token with a picture of a log being sawn on it). Includes a wacky d6 with '23' on one face. Best pun on the 'Geek. Trying to repel a bunch of nasty little organ-kicking invaders who try to run up your !#@&% is fairly whacky; alternately, you can play a pack of freedom-loving warriors trying to do in the evil giant Blotomus. What other game has a both a finduncle and a prolobosinator? This one always gets me to smile. 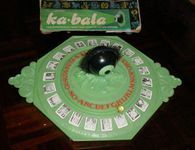 The thing is i remember playing with this game as a child. 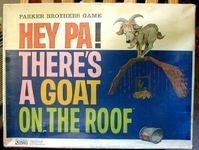 Not playing the game, just with the goats and barns. I remember being in the dollar store and seeing about 500 copies of this game, (I almost bought a couple of em' for the potential parts) therefore I can't believe no one on the geek will fess up to owning this game. I think this could de-throne the vanilla ice game as there are five of these turkeys on the cover of this game. Cow breeding at it's finest, and filthiest. More details than you really want to know. Connect the tubes, wrap them about, pop in the marble, Wow look out. Now you're bending, up and down forward, backward, all around. Try to get the marble from the starting point to the ending container in the quickest time. Play alone or with a partner. It would have been fun but the rules are broke just like the humor. The idea here is to go on the worst date possible. But wait, that's only half the game. After your horible date you meet up with friends (the other players) at a bar and try to get free drinks out of them by telling em your sob story of your horrible date. Watch out, if your friend's dates are worse you'll be the one ending up buying drinks! Appearently, whoever spends the least amount of money on drinks at the end of the night is the winner. While Grade Up to Elite Cow obviously wins, I think that this game does get honorable mention. It is all about Breeding the perfect Lawn Gnome. The fact that they are bought, sold, as worked as slave labor in the garden is weird. The fact that they are all male is just dowright whacky. Racing Easter Island heads is pretty kooky. What could offer more 'harmless' fun than a game where kids put on oversized plastic thumbs and attempt to stuff sticks of dynamite into a shack before it explodes? 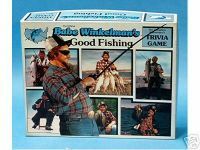 I'm sure Ted Kaczynski and his brother spent many a happy hour playing this one. 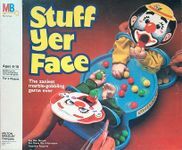 The game of crazy, marble-eating-clown type fun. Manouver the clowns arms to stuff marbles into his mouth. I think this one should actually be classed as an "historical simulation", after the world-famous Crazy, Marble-Eating-Clown incident of 1948. The game of crazy, tennis-racquet-frog-whacking type fun. 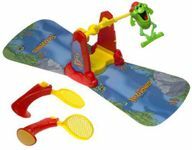 Hit the talking frog with the tennis raquets! I think THIS one should actually be classed as an "historical simulation", after the world-famous Tennis-Racquet-Frog-Whacking incident of 1904. This game will electrocute, inject and or firing line any other game on this list. 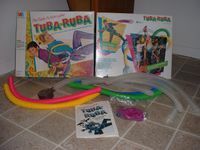 It is the single most inappropriate game I've ever owned. I bought it off eBay the other day. I opened it and then tossed it away. I can't think of whackier game!